Swarovski (Austrian) Crystals: Made in Austria, Swarovski products are considered to be one of the finest products of their kind in the world! These crystals are machine polished, unlike Czech glass, so are of a higher quality and cost as well. Czech Glass Beads: Imported from the Czech Republic, these beads are machine faceted then polished by glazing in an oven (fire polished). This gives them a "softer" look and smoother feel. Sterling Silver: Sterling Silver is 92.5% silver and 7.5% copper. The copper add the durability and strength. Pure silver is too "soft" to hold up on its own. Silver dipped copper offers an affordable option to expensive Bali sterling but is still of high quality. Get the look without the cost! 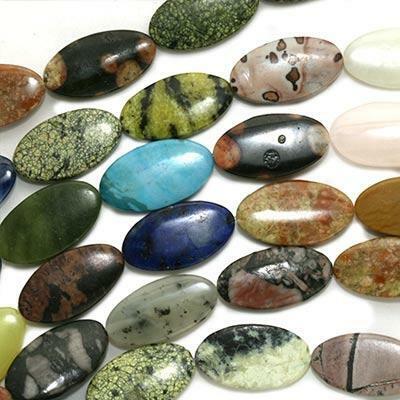 Natural stones that generally have a lower value than precious stones, including amethyst, aventurine, agate, carnelian, garnet, opal, rose quartz, and others. Some people believe that healing powers are associated with certain gemstones. Click here for a healing gemstone chart. Handcrafted furnace glass cane beads are high quality beads made by several companies in the United States, each bead is handcrafted one by one with cane glass rods. Handcrafted glass beads made one at a time with a seven step process, which increases the cost compared to normal pressed glass beads, slender rods are manipulated to particular shape using a torch then placed in a kiln to harden.There is a difference between handcrafted Lampwork glass beads and mass produced Lampwork beads that are created in factories for pennies. With the personal touch that goes into a handcrafted Lampwork beads by the Artist; such as the best glass rods, unique color combinations and designs, and a bead that is not mass produced also comes a higher priced one of a kind sought after finished jewelry design. Some of the Lampwork beads used in some of my designs are created by US artists and some are imported glass beads from other countries. Some of the beads used are mass produced and others are limited editions. Some are just impossible to find again. These are cast metal beads that are made without lead. 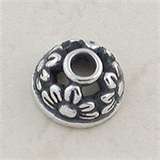 Pewter is a cost-effective alternative to sterling silver and bali silver and is found as spacers, clasps, charms, etc. Faux Pearls - These are usually plastic bead with a imitation 'pearl' coating that create a inexpensive pearl look in uniform sizes. Often this 'pearl coating' will crack or rub off over time leaving the original unattractive bead that it started as. Isabella's Beads uses Swarovski's crystal-based pearls as they are scratch resistant and are a higher quality that is designed for longer wear. SWAROVSKI - These beads are created for durability and strength. They are uniform in size and are created by the same company that produces Swarovski Austrian crystals. These gorgeous crystal-based pearls are scratch resistant and have a satin like luster and come in a variety of colors. Aurora Borealis Finish (AB): A rainbow finish added to the outside of glass and crystal beads after polishing. AB indicates the finish on half of the bead while 2xAB inidicates the finish on the entire bead. This oxidized finish can be found on .925 sterling silver and silver-plated beads. This look is created by darkening segments of the bead giving it an 'antiqued' silver finish look. Silver naturally oxidizes as it is exposed to air. An expensive whitish-gray metallic element from the platinum family to prevent tarnishing.